SSC has updated the tentative vacancies for SSC CGL 2016. 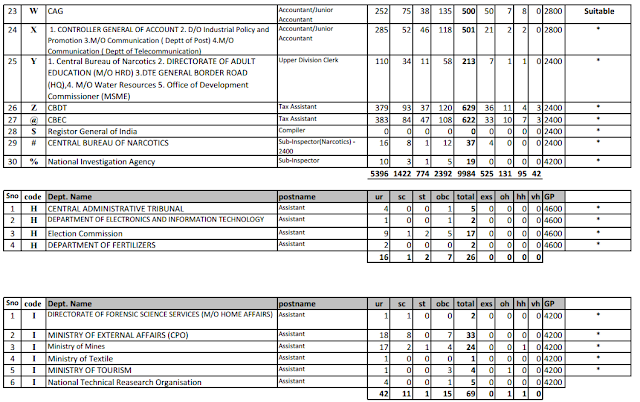 Vacancies has increased from 9990 to 9996. You may download the PDF from the link provided below. Today SSC has again updated the tentative vacancy list of SSC CGL 2016. The good NEWS is that SSC has updated the vacancy from 9941 to 9984. For Detailed information you may download the tentative vacancy list from the link provided below. Today ssc has updated the annual exam calendar of SSC exams. You may see the snap shots here or click on the links provided below to download pdf from official website of SSC. To View examination calendar goto ssc.nic.in home page, click on candidates corner, click on Examination Calendar, then click on tentative schedule of examination. General cleanliness & upkeep of the Sectionl Unit. Other non-clerical work in the Sectionl Unit. Driving of vehicles, if in possession of valid driving licence. NOTE: The above list of duties is only illustrative and not exhaustive. Ministries/ Departments may add to the list, duties of similar nature ordinarily performed by officials at this level. CG Police Bharti: Chhattisgarh Police Constable GD Recruitment 2016 Details has tabulated above. The Aspirants can get all the Latest News about State Government employment and Central Govt jobs in Employment News page of recruitment.guru website. Aspirants who are looking for latest govt jobs in Chhattisgarh can utilize this Chhattisgarh Police Recruitment 2016 opportunity. Before you initiating the applying process go through the CG Police Constable jobs Eligibility conditions. If meet those requirements anyone can participate in the recruitment drive of Chhattisgarh Police Tradesman Jobs. Therefore, interested participants of Police Jobs in Chhattisgarh have to apply through Online before the due date. You can also get the Chhattisgarh Police Constable Recruitment Details in the official website www.cgpolice.gov.in. CG Police Bharti: The Eligible individuals who satisfy the eligibility according to the Chhattisgarh Police GD Constable jobs can fill the CG Police Jobs. Here we provided complete details about CG Police Constable Recruitment 2016 . Therefore for further details about Chhattisgarh Police Constable jobs Notification, Exam Date, CG Police Vacancy details, Eligibility criteria, Selection process, Pay scale, online application filling process details are briefly given below. The Job holders can also get other latest updates on Sarkari jobs through New Govt Jobs Webpage of recruitment.guru website. CG Police Jobs: Therefore, CG Police Constable jobs Vacancy details are tabulated above. Go through the below provided Chhattisgarh Police Tradesman Jobs Notification regarding any doubts on the Recruitment process. Follow Chhattisgarh Police Constable GD Recruitment Eligibility details down the page. Individuals applying for Chhattisgarh Police Constable jobs have to check the eligibility conditions. If they satisfy those requirements anyone can apply for Chhattisgarh Police Recruitment. The eligibility conditions given here are from the officially released Chhattisgarh Police Jobs Notification which is given below. CG Police Bharti: Candidates applying for CG Police Constable jobs must attain below given age limit requirements as on 01.01.2016. Refer Chhattisgarh Police Constable Recruitment Notification for Age relaxation details. 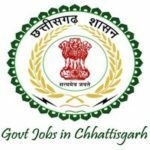 Chhattisgarh Police GD Constable jobs: Passed 10th/ 8th OR Higher secondary education or any equivalent examination as per 10+2. Chhattisgarh Police Constable GD jobs: Passed 8th class from recognized Chhatisgarh/ Madhya Pradesh schools. Check CG Police Constable Recruitment Notification for detailed qualification requirements. Chhattisgarh Police Constable jobs: Rs. 5200/- to Rs. 20200/- with the Grade pay of Rs. 1900/-. The application form for Chhattisgarh Police Constable jobs released under Chhattisgarh Police Recruitment 2016 is available here. Therefore, interested applicants can link on below provided apply online link. Fill the application and submit it before the deadline. Follow below given CG Police Constable Recruitment apply steps. How to apply for Chhattisgarh Police Constable Recruitment 2016 ? Directly open the Notification provided below. Read the notification carefully before applying CG Police Constable jobs through online. Fill the Chhattisgarh Police Jobs form in the given format without mistakes. 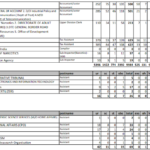 Take a printout of the CG Police Jobs Application for future use.